Japan’s Hayabusa2 is now exploring asteroid Ryugu, and NASA’s New Horizons is closing in on the Kuiper Belt object nicknamed "Ultima Thule." At this historic juncture in the exploration of our solar system, more than 700 researchers are gathering in Knoxville, Tennessee, for the 50th annual meeting of the Division for Planetary Sciences (DPS) of the American Astronomical Society (AAS). Two of four daily press conferences will feature the latest news from the Hayabusa2 and New Horizons teams. Two others will highlight new findings on various planets, moons, and asteroids based on observations from ground- and space-based telescopes as well as from robotic interplanetary missions. The meeting takes place 21-26 October at the Knoxville Convention Center, 701 Henley St., Knoxville, TN 37902. The AAS/DPS offers complimentary press registration to journalists and public-information officers (PIOs); see details below. Meeting hashtag: #dps18; you may also wish to follow @DPSMeeting and @AAS_Press on Twitter. All attendees at the meeting — including press registrants — are expected to follow our Guide to AAS Meeting Etiquette and Anti-Harassment Policy for AAS & Division Meetings & Activities. Your participation in the meeting is taken to signify your acknowledgment that you have read these guidelines/policies and your agreement to adhere to them. Accordingly, please read them before you come to Knoxville and abide by them once you arrive. Our “Meetings by AAS” mobile app puts the entire conference program in your pocket and ensures that it’s always up to date. If you’re tired of carrying around a bulky program book, you’ll really appreciate having this app on your smartphone or tablet. Meetings by AAS works on iOS and Android devices. Users of Windows Phone and BlackBerry devices, as well as users of laptop computers, can access the app via a Web browser. On your smartphone or tablet, visit the Apple App Store (iOS) or Google Play (Android) and search for Meetings by AAS. 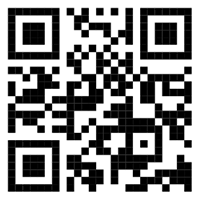 Alternatively, use your QR reader to scan the QR code at right. Download, install, and open the app. iOS users: tap the Download Guides button; Android users: tap the downward-facing arrow to browse guides. Select the 50th Annual DPS Meeting guide. Alternatively, go to https://guidebook.com/g/dps50/ and follow the instructions you find there. The AAS/DPS offers complimentary press registration to bona fide working journalists and PIOs, as described on our press-credentials page. Advance press registration is now closed; see our list of current press registrants. Upon arrival at the Knoxville Convention Center, preregistered press should proceed to the AAS/DPS registration area in the Henley Concourse on the third floor. Badges won't be available before 1 pm EDT on Sunday, 21 October; please try to pick up your badge before the DPS Opening Reception (see below). Reporters and PIOs who need to register on-site in Knoxville should go straight to the AAS/DPS registration desk at the Knoxville Convention Center and ask for a press-registration form. You'll be asked to take it to the press office (Room 300C on the third floor) to have the form authorized by the AAS or DPS press officer, after which you may return to the registration desk to print your badge. A press office will be set up in Room 300C on the third floor of the Knoxville Convention Center and will be open to journalists during normal conference hours. Among other amenities, it will offer workspace, internet connectivity, and a printer. Thanks to the Universities Space Research Association (USRA) for generously sponsoring the press office with refreshments for on-site press registrants! We will not have a separate press interview room for use by press registrants, but except during press conferences (see next section), Room 300D will be available. To reserve this space at a particular date and time, you’ll be asked to fill out the sign-up sheet that will be posted on the door or in the press office (Room 300C). News briefings for the media will be conducted daily Monday-Thursday, 22-25 October, during the midday lunch break, next door to the press office in Room 300D, which will be equipped with a sound system, mult-box, and wireless internet connectivity. Note that lunch is from 12:00 to 1:30 pm EDT each day (EDT = UTC − 4 hours). The briefings themselves will begin at 12:15 pm EDT; each will last about 1 hour. There is no press conference on Friday, 26 October. Following is the press-conference program, which is subject to change. In [square brackets] under each speaker’s name is the session or paper number on which their presentation is based, where applicable. All findings are embargoed until the time of presentation at the meeting. “Time of presentation” means the start time of the oral or poster session in which the paper will be given, or the start time of the corresponding press conference (if any), whichever comes first. Please review the complete AAS/DPS embargo policy before coming to Knoxville. Note: All new discoveries are subject to confirmation by independent teams of scientists. Inclusion here does not imply endorsement by the American Astronomical Society or the Division for Planetary Sciences. The AAS and DPS do not endorse individual scientific results. Added 22 Oct. 2018: Some presentation titles now link to the speakers' presentation files (PDF or PPT); additional links will be added as the week progresses. These files are provided for personal use only. If you wish to publish or otherwise reproduce any of the content in these files, you must obtain permission from the presenters — otherwise you may be in violation of copyright law. If you need help contacting a presenter, email AAS Press Officer Rick Fienberg. Members of the New Horizons team will preview the mission’s 1 January 2019 flyby of “Ultima Thule” in the Kuiper Belt. This will be the most distant planetary encounter in history. Team members will cover the significance and challenges of the flyby, its science goals and operational timelines, and the Kuiper Belt in the context of solar system exploration. AAS WorldWide Telescope visualization: "New Horizons: To Pluto & Beyond"
Journalists unable to attend the meeting in person may tune in to our Monday-Thursday briefings streamed live on the Web. Since the webcast includes audio, video, and presentation slides, you must have a broadband (high-speed) internet connection to watch and listen. Also, your Web browser must have the free Adobe Flash plug-in. The webcast also includes a chat window whereby remote participants may ask questions, but the chat window requires a password (the audio, video, and slides do not). If you wish to participate in the Q&A chat, contact AAS Press Officer Rick Fienberg for the password, which is for journalists only and which is the same for all the week's briefings. Please don't wait till the last minute to request the password, as we are insanely busy in the minutes before a press conference begins and will likely not see your request till the briefing is over. We can’t guarantee that all questions received from webcast viewers will be asked aloud — it depends on how much time we have and how many questions we’re getting from on-site reporters. Make sure your pop-up blocker is disabled or that it allows pop-ups from aas.org. In the webcast window, press the Play (►) button to launch the live stream. If you wish to join the Q&A chat (see above), enter the password into the input box under the webcast window. Then press the Open Chat Window button. You’ll be asked to enter your name; please use your real first and last names, not a cutesy internet nickname. You can resize the chat window and move it to any convenient position on your screen. To ask a question, type it into the input box near the bottom of the chat window and click the Send button. After the meeting, archived webcasts will be freely available via our online archive. In addition to daily oral and poster sessions, the meeting features more than a dozen plenary talks from distinguished planetary scientists. See the block schedule, online program, or mobile app for dates, times, and locations. André Izidoro (São Paulo State University) and Thomas Kruijer (Lawrence Livermore National Laboratory) will offer new views of the evolution of the early solar system, while Jennifer L. Eigenbrode (NASA Goddard Space Flight Center), Courtney Dressing (University of California, Berkeley), and Hikaru Yabuta (Hiroshima University) will present new views on habitability near and far. Fran Bagenal (University of Colorado, Boulder), Carolyn Brinkworth (National Center for Atmospheric Research), Clark Chapman (Southwest Research Institute), Anita Cochran (University of Texas, Austin), Dale Cruikshank (NASA Ames Research Center), Thomas McCord (Bear Fight Institute), David Morrison (NASA Ames Research Center), and Carle Pieters (Brown University) will discuss significant developments in the history of planetary science and look to a future that it more diverse, equitable, and inclusive. Two 2018 DPS award winners will give prize talks: Francesca DeMeo (Massachusetts Institute of Technology), recipient of the Harold C. Urey Prize for her work on asteroids and asteroid classification; and Julio Fernandez (Facultad de Ciencias, Universidad de la República, Montevideo, Uruguay), recipient of the Gerard P. Kuiper Prize for his work on comets and the origin of the solar system. Bonnie Buratti (Jet Propulsion Laboratory), winner of the Carl Sagan Medal for outstanding public communication by an active planetary scientist, will give a public talk to which the citizens of Knoxville will be invited. Faith Vilas (Planetary Science Institute) will receive the Harold Masursky Award for meritorious service, and Alexandra Witze will receive the Jonathan Eberhart Planetary Sciences Journalism Award for her article “Next Stop, Mars,” which appeared in Nature. The opening reception welcomes all attendees and registered guests; food will be provided, and there will be a cash bar. After the last talk of the last sessions, join your colleagues to celebrate 50 years of successful DPS meetings and have some ice cream. Hear from representatives of funding agencies, space agencies, observatories, and planetary missions. Bonnie Buratti (Jet Propulsion Lab) received the 2018 Carl Sagan Medal for excellence in public communication for her highly effective education and public outreach efforts. She is noted for conducting teachers' workshops, delivering popular public talks, and writing in encyclopedias, blog posts, and a recently published popular book, Worlds Fantastic, Worlds Familiar (Cambridge, 2017). Open Mic Night has become the premier venue for planetary scientists to share their talents with the world (well, with other planetary scientists, anyway). Performances typically include singing, playing various instruments, poetry, storytelling, comedy, magic, and more. Middle- and high-school students from the Knoxville area will come to the DPS meeting with teacher and parent chaperones. They'll visit the Exhibit Hall to engage in hands-on educational activities supervised by attending astronomers and planetary scientists. The event, which makes a great "photo opp," is sponsored by the AAS, DPS, and Johns Hopkins University Applied Physics Laboratory. Written by Univ. of Tennessee science journalism professor (and longtime AAS member) Mark Littmann, Little Lessons for Lina is a scientifically and historically accurate account of the life and discoveries of Caroline Herschel, the first woman to be a professional astronomer. There is no fee for attendance. If you don't already receive astronomy-related press releases forwarded by email from the AAS Press Office, you should sign up now to guarantee that you receive future meeting advisories as well as electronic copies of all press releases issued during the meeting. To sign up for the AAS press-release-distribution service, for which there is no charge, please fill out the form linked from our Join the AAS Press List page. As described there, with few exceptions, only accredited journalists and public-information officers are eligible to receive press releases forwarded by the AAS. The Division for Planetary Sciences (DPS), founded in 1968, is the largest special-interest Division of the American Astronomical Society (AAS). Members of the DPS study the bodies of our own solar system, from planets and moons to comets and asteroids, and all other solar-system objects and processes. With the discovery that planets exist around other stars, the DPS has expanded its scope to include the study of extrasolar planetary systems as well. The AAS, established in 1899, is the major organization of professional astronomers in North America. The membership (approx. 7,500) also includes physicists, mathematicians, geologists, engineers, and others whose research interests lie within the broad spectrum of subjects now comprising contemporary astronomy. The mission of the AAS is to enhance and share humanity’s scientific understanding of the universe, which it achieves through publishing, meeting organization, education and outreach, and training and professional development.